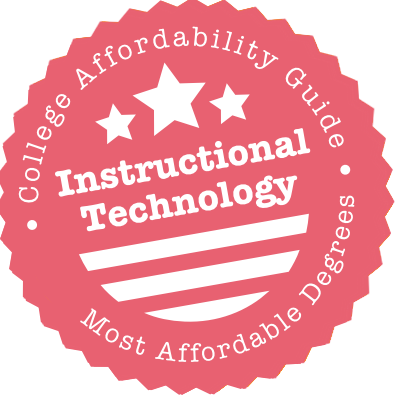 Scroll down to see the most affordable instructional technology degrees, as well as info on the different types of instructional technology degrees and program accreditation. The Department of Educational Psychology at Texas A&M University has a Master of Education in Educational Technology for individuals who want to work as instructional designers or technology leaders in education, industry, or government. The coursework for this program is delivered 100 percent online. The 36-credit curriculum includes five core courses with students selecting all other classes as electives from a long menu of approved coursework. Applicants should have a bachelor's degree with a GPA of 3.0 or higher for the last 60 credits. GRE scores are not required for this program. Through its Department of Computer Information Systems, Buffalo State SUNY offers an MSEd in Educational Technology that helps K-12 educators and training specialists expand their knowledge of technology in educational settings. The 33-credit MSEd curriculum focuses on the design, development and use of technology in the instructional process, with students completing 18 credits of core courses, including a master's project. Elective requirements vary depending on whether a student in pursuing teaching certification. Those seeking certification are required to take four courses in their certification content areas and one elective course, while those who aren't seeking certification take five elective courses. SUNY Oneonta offers an online master's program in educational technology that is open to students who already have initial teaching certification. Candidates who complete the program are eligible for professional certification in the area they received initial certification in, and they are also eligible to be certified as an Educational Technology Specialist. To complete the 39-credit program, candidates must complete nine credits in core classes, 12 credits in content pedagogy, and 18 credits in technology classes. Technology coursework covers topics such as integrating technology in education, instructional technology design principles, and multimedia and instructional product design. Master's candidates must also complete an action based research project. All work for the degree must be completed within six years. The Department of Leadership and Educational Studies at Appalachian State University offers a Master of Arts in Educational Media with a concentration in instructional technology specialist/computers. The instructional technology concentration is offered in two tracks of study: one for K-12 educators and administrators looking to study instructional applications and computer technologies and one for those who want to teach in community colleges or become corporate trainers. Upon completing the program, students are eligible for state Technology Director licensure and the Technology Facilitator endorsement. The instructional technology program is offered online, and students in the program are primarily part-time students who are employed in the field of education. The Department of Instructional Design and Technology (IDT) runs programs at both the Macomb and Quad Cities campuses. The MS in IDT comes with an optional Technology Specialists Emphasis for state-certified teachers. (The department also has graduate certificates in Educational Technology Specialist and four other areas, including Workplace Learning & Performance and Instructional Media Development.) One of the most effective ways to save money on the degree is by pairing it with a BA in General Studies or a BS in Graphic Communication; students who do so can earn both degrees in five years flat. Through its Department of Educational Theory and Practice, SUNY at Albany offers an MS in Curriculum Development and Instructional Technology that can be completed on-campus or online. The MS program includes 30 credits of coursework and requires that students choose coursework in several broad areas, including instruction, foundations of education, human learning and development, and either curriculum development or instructional technology. Students also choose between completing a research seminar or a master's thesis. Additionally, the Department offers a Certificate of Advanced Study in Curriculum and Instruction with a concentration in instructional theory, design and technology and a PhD in Curriculum and Instruction with a concentration in instructional technology. Educators interested in digital learning can earn a Master of Education or Master of Science in Learning Design and Technology through NC State's College of Education. The program has three strands (digital leadership, design, or inquiry), and candidates select one area of emphasis but take courses in the other two strands as well. The M.Ed. program requires 10 courses, for 30 credits. The M.S. requires an additional six credits and a thesis, and it is generally pursued by candidates who want a Ph.D. or research career. Licensed teachers can add a computer education or technology specialist endorsement after completing this program. NC State delivers the coursework for these degrees online. The Department of Counseling Educational Psychology, and Special Education at Michigan State University offers a Master of Arts in Educational Technology, as well as a graduate certificate in educational technology. The MA in Educational Technology is a fully online program that requires 30-credits of coursework and does not require a thesis. The curriculum includes three mandatory courses, while the remaining courses can be selected by students based upon their career goals and interests. Many students in the program use their remaining credits to receive Educational Technology (NP) endorsement in the state of Michigan. The educational technology certificate requires the completion of three courses and can also be completed entirely online. The College of Education at Minnesota State University-Mankato offers a Master of Science in Educational Technology that can be completed entirely online. The M.S. in Educational Technology is a 34-credit program that includes two introductory courses and three research core courses. Research core courses include research methodology, scholarly writing and a one-credit capstone project. Students write a paper, project, thesis or manuscript to fulfill their capstone requirement. M.S. students are also required to complete seven elective courses. The M.S. program is delivered in an asynchronous format and can be completed on a full or part-time basis. Full-time students can complete it in two years, and part-time students are given up to six years to complete the program. The Department of Educational Technology & Literacy at Towson University offers a Master of Science (MS) in Instructional Technology degree. The program is designed for students who want to learn how to integrate technology into classroom teaching. Other education professionals seeking the skills and knowledge to coordinate and plan educational technologies at the school, district or state level can also benefit from this program. Most course activities take place online with only a few scheduled on-campus meetings. The department also offers a Doctorate in Education (Ed.D.) in Instructional Technology degree. In this program, students learn how to integrate digital learning tools to meet diverse instruction needs across the educational spectrum. The College of Education at California State University-Fullerton offers a Master of Science in Instructional Design and Technology that teaches professionals working in technology or curriculum development how to apply new technologies to teaching and training. The 21-month MS program requires 10 courses, including a master's project and a practicum. Students complete the program in cohorts and take two courses over a 16-week period known as a "term segment." At the beginning of the program, students are required to participate in a one-day "boot-up" orientation meeting, which includes workshops and other activities that familiarize students with program requirements and instructors. Students are also required to participate in a midpoint checkpoint symposium during the fourth term segment. The College of Education and Human Services offers a Master of Arts in Instructional Design and Technology. The program is offered entirely online. They also offer a Doctorate (Ed.D.) in Instructional Design and Technology. The program features courses in instructional design and technology, program evaluation, and educational psychology. Students who pursue these degrees often pursue successful careers as technology-integration specialists within educational settings. Students in this program will take such courses as IDT Models and Theories, Distance Education, Authoring Systems, and Technology Integration. University of Northern Iowa students pursuing a bachelor's degree at the College of Education have the option of adding a minor in Educational Technology to their program. Students learn to design technology-rich learning environments and to adopt emerging technologies as a way to facilitate and enhance the learning process. The college also offers a Master of Arts (MA) in Instructional Technology degree. Students accepted to the program can chose a thesis or non-thesis option. Most of the courses for this program are available online. Students learn to plan and produce instructional media for a wide range of students, work with cloud-based, collaborative applications, and integrate technology into all subject areas. The Grossman scholarship is open to both undergraduate and graduate Instructional Technology students. UNC Charlotte offers a Master of Education and Graduate Certificate in Instructional Systems Technology. Students in the program choose from three concentrations depending upon their career goals: School Specialist, Training and Development, or Online Learning and Teaching. Students entering the program who want to qualify for a North Carolina license as an instructional technology specialist must have a valid teaching license and at least two years of experience. The 36-credit master's program requires students to complete 18 credits in foundational classes, 12 credits in electives, and six credits in an internship and capstone project. To earn the graduate certificate, students must complete 18 credits. Both programs are offered in a 100 percent online format. Oklahoma State University's College of Education offers MS and PhD degrees in Educational Technology. The MS in Educational Technology is designed for teachers or support staff members who want to become educational technologists. A specialization is also available in school library media for students who want to become certified school library media specialists. Both the general and school library media track of study can be completed almost entirely online. The PhD in Education with a specialization in educational technology requires 9 credits of core courses, 12 credits of research courses and 24 credits of specialization courses. PhD students are also required to complete 9 credits of courses outside of their major and 15 credits of dissertation coursework. UGA students interested in an instructional technology degree can pursue the Master of Education (M.Ed.) in Learning, Design, and Technology program offered by the Department of Career and Information Studies at the College of Education. The program offers Instructional Technology as an area of concentration. The curriculum for the program is approved by the Georgia Professional Standards Commission. The department also offers an Educational Specialist (Ed.S.) in Learning, Design, and Technology degree. As with the M.Ed. program, students are allowed to choose Instructional Technology as their area of concentration. The M.Ed. and Ed.S. programs can be completed almost entirely online. Both programs train students to design and implement technology-enhanced lessons for a wide range of educational settings. The Master of Education (M.Ed.) in Instructional Technology program offered by the University of Maine's College of Education and Human Development is based on the standards set by the International Society of Technology in Education (ISTE). The program consists of coursework, research and clinical experiences that train students in the effective and innovative use of current and emerging technology in a variety of educational settings. Upon completion of the program, students may earn the Maine Department of Education 680 (Computer Teacher) endorsement. There is also graduate certificate in Classroom Technology Integrationist program available. The program is designed to provide classroom teachers with the knowledge and skills to use and integrate existing technology within their schools and districts. UMass Boston students who are interested in pursuing an instructional technology degree can apply for admission to the Master of Education (MEd) in Instructional Design program at the College of Advancing and Professional Studies. The program is a multi-disciplinary and comprehensive course of study that is designed to accommodate both full-time and part-time students, with classes meeting only in the evenings once a week. Non-degree students are admitted to the program as space allows. The curriculum is focused on three areas: the foundational and conceptual framework for the instructional design process; developing instructional strategies and skills to facilitate adult learning; and, using educational technology and media to enhance learning. Canisius College offers a master's degree in education technologies and emerging media that leads to New York State certification as an educational technology specialist. This program focuses on using technology to enhance learning within an educational setting. There is also a master's degree that does not lead to certification and designed for students who plan to deliver online programs outside a formal educational environment. Both programs are available online and can be completed in as little as 15 months. Students seeking certification must undergo a supervised practicum experience, while students not seeking certification are required to complete an integrated master's project. Both requirements can be completed within a student's geographical area. Canisius College also offers a 16-week Education Technologies Advanced Certificate. SUNY Potsdam's School of Education and Professional Studies offers a Master of Science in Education (M.S.Ed.) - Educational Technologist Specialization program that is accredited by the National Council for Accreditation of Teacher Education (NCATE). Although teaching certification is not necessary for admission, students who already hold initial certification can be recommended for additional certification as an Education Technology Specialist upon completion of the program. The curriculum includes coursework in the following topics: Technology in Education, History and Philosophy in Technology Utilization, Technology Coaching, and Systematic Design for Performance Improvement. The M.S.Ed. program prepares students for technology leadership positions not only in K-12 schools and higher education, but also in social service agencies, non-profit organizations, the business sector, and the military. The Department of Learning Technologies at the University of North Texas offers a Bachelor of Applied Arts and Sciences in Applied Technology & Performance Involvement, a Master of Science in Applied Technology & Performance Improvement, a Master of Science in Learning Technologies (accelerated program available), and a Doctor of Philosophy in Applied Technology & Performance Improvement. The learning technologies Master's program has a choice of tracks in instructional systems technology, instructional systems, and teaching and learning with technology. In these programs, students may take courses such as Web Authoring, Personal Development, Instructional Strategies in Career and Technical Education, and Technical Presentation Skills. The University of South Dakota offers an online Master of Science in Technology for Education and Training. This degree provides educators with the preparation to use available and emerging technologies for instruction. This program focuses on the principles of learning design and an instructional systems approach. Students are required to have an undergraduate grade point average of 2.7 or higher to be admitted, and they are required to have a grade point average of 3.0 or higher if they have an M.A. or M.S. In this program, students will learn how to analyze and access the uses of technology in all sorts of instruction as well as develop and design multimedia content for instructional uses, among other things. The Master of Science (MS) in Educational Technology degree offered by UCMO's Department of Career & Technology Education can be pursued entirely online. There are however, some electives that are only offered in a face-to-face format. Students learn to create and support digital-age educational environments that enhance and maximize the learning of a diverse group of students. The program helps students to develop the skills needed for conducting needs assessment, developing technology-related learning programs, and evaluating the impact on instructional practice and student learning. The department also has an Educational Specialist (Ed.S.) in Educational Technology program available. Students learn how to integrate technology into a variety of educational settings as well as use it effectively in their own research. The Department of Educational Leadership at Southern Illinois University offers a Master of Education (M.Ed.) degree in instructional technology. Students admitted to the program have the option of pursuing one of two areas of emphasis available - educational technology or instructional design and performance improvement. There is also an 18-hour post-baccalaureate certificate program in web-based learning available. This is an online program that requires students to complete the following courses: web design for instruction, principles of instructional technology, instructional systems design, performance technology, managing instructional development, and distance education. The instructional technology program at SIU is available completely online, although students can choose the course delivery format that is most advantageous for them, including face-to-face and hybrid deliveries. Instructional Technology is a master's-level program at Wisconsin Lutheran College. Designed for teachers who hold certification (but available to those who do not), it includes both a practicum and a capstone project. Educators who teach at a Christian K-12 school may claim a 25 percent tuition discount when pursuing an MA at the school. The school maintains a local chapter of the National Education Association, called the Future Teacher's Education Association. The College of Education at West Texas A&M University offers a Master of Education (M.Ed.) in Instructional Design and Technology program with a curriculum that accommodates the goals and interests of diverse student groups. The program supports professional educators who want to facilitate and enhance student learning by creating a technology-supported learning environment. Students who are interested in acquiring and applying web design skills to apply in a business or corporate environment and in assuming leadership roles in a high-technology sector will also benefit from this program. The M.Ed. program is offered in an online format to accommodate students with full-time jobs. Courses include Foundations of Instructional System Design and Advanced Business Productivity Applications. Emporia State University's Teacher College offers an MS in Instructional Design and Technology that can be completed online, on-campus or through a combination of both learning styles. Students in the 36-credit program complete seven core courses, three electives, one research course and a comprehensive project. The program focuses on major subjects such as instructional design, computer-authoring tools, software selection and maintenance, information access and delivery systems, and staff development. The program is designed for both practicing P-12 educators who want to improve curriculum and better integrate technology into their classrooms and those looking to serve as instructional designers and trainers in corporate, military or other institutions. Instructional design and technology students are eligible for graduate assistantships that include a stipend of approximately $7,344 per year. UCF's College of Education and Human Performance offers a graduate certificate in Instructional/Educational Technology that allows students to meet the subject matter requirement of the National Educational Technology Standards for Teachers. The curriculum includes coursework in: Application Software for Educational Settings, Electronic Resources for Education, Fundamentals of Technology for Educators, Integrating Technology into the Curriculum and Multimedia in the Classroom. The Master of Arts (MA) in Instructional Technology program allows students to choose an Educational Technology Track. This specialization helps educators in Pre-K-12 and Higher Education to integrate computer and digital technology in the classroom to enhance the learning experience. The college also offers Doctor of Education (Ed.D.) and Doctor of Philosophy (Ph.D.) in Education with Instructional Technology Specialization programs. East Carolina University offers a Master of Science in Instructional Technology degree that gives students a sound foundation in instructional design and trains them in the development of computer-based instructional materials. This 33-semester-hour program includes courses in multi-media instructional product development, instructional graphics for educational media, and instructional strategies for distance learning. There is also a Master of Education in Instructional Technology program available. Students who complete this program are eligible for NC licensure 077 (Instructional Technology Specialist - Computers). There is a special endorsement in computer education available, as well as graduate certificates in computer-based instruction and in distance learning and administration. Each program requires the completion of 18 credits, which can be applied towards a master's degree in instructional technology. The College of Education at Grand Valley State University offers two Master of Education programs in educational technology: a traditional hybrid educational technology M.Ed. program and an online educational technology M.Ed. program. Both programs require the same coursework, however the traditional hybrid program is delivered through a combination of in-person and online learning, while the online program is delivered completely online. The M.Ed. curriculum includes three credits of social foundation courses, 21 credits of emphasis area courses, a research foundation course and a three-credit elective or practicum. Students are also required to complete a capstone experience in the form of a project or master's thesis. GVSU's M.Ed. program is aligned with the International Society for Technology in Education Standards for Coaches. The Donald R. Watson College of Education at UNC Wilmington offers a Master of Science in Instructional Technology (MIT) degree that gives students the opportunity to craft an individualized program of study that supports their professional goals and interests. The general program has an interdisciplinary curriculum drawing from diverse fields of study including communication theory, educational and applied psychology, instructional systems design, computer science, and systems theory. The MIT program also offers online Post-Baccalaureate Certificate programs in Instructional Technology Specialist (ITS) and 079 Special Endorsement in Educational Computing and Technology Facilitation (TF). Only students who enter the program with a North Carolina class A teaching licensure will be qualified to apply for the TF certificate upon completion of the program. Western Michigan University offers a Master of Arts in Educational Technology degree through the Department of Educational Leadership, Research and Technology. Students learn how to lead and/or train others in the use and management of technology in different settings. The curriculum includes courses such as advanced instructional technologies, design and development for learning, and research in educational settings. All required courses for this 30- to 33-credit-hour program are available online. The university also offers a graduate certificate in educational technology that focuses on the instructional aspects of information and communication technology in a school setting. As part of the Department of Educational Leadership, Research and Technology, instructional technology students can apply for the Van E. Cooley Memorial Scholarship for Educational Leadership. The University of Oklahoma Jeannine Rainbolt College of Education offers a Master of Education in Instructional Psychology & Technology as well as a PhD in Instructional Psychology & Technology and a Graduate Certificate in Applications of Educational Research and Evaluation, which can be completed 100% online. In the Master's Program, students can specialize in 21st Century Teaching and Learning, Instructional Design & Technology, Educational Psychology, and Integrating Technology in Teaching. The IPT program offers a multifaceted and comprehensive approach to the study of instruction by integrating instructional technology and educational psychology. In the Instructional Psychology and Technology, students focus on the areas of technology and instruction, the psychology of learning, and tools of inquiry and implementation. The Master of Science in Instructional Technology program offered at the University of Central Arkansas has three areas of concentration: distance education, media design & development, and technical support of instructional technologies. Up to 95 percent of the courses required for the completion of the degree are available online. Most students earn their degree within two years. Coursework includes classes in technology planning and leadership, intellectual property and copyright, integrating media and technology into media and learning, and fundamentals of web design. Students are required to complete a culminating activity related to their area of specialization in order to graduate. Students who are also practicing educators may be eligible for the Parsons-Burnett Grant from the Arkansas Retired Teachers' Association ($1,500). The College of Education at Florida State University offers Master of Science and Doctor of Philosophy degrees in instructional systems and learning technologies. The 36-credit-hour MS degree can be completed in two years and is offered both online and on campus. The doctoral program is available only on campus and requires the completion of 48 credit-hours. There is also a graduate certificate in online instructional development available. Coursework can be taken online or on campus and can be completed as part of a graduate degree or as a stand-alone program. Public school teachers who are pursuing a master's or specialist degree may be eligible for the Henderson Family Fellowship, which helps pay for tuition and fees for up to two semesters. The Department of Leadership, Technology, and Human Development at GSU's College of Education offers a Master of Education (M.Ed.) in Instructional Technology degree. Graduates of the program fulfill the requirements for the Georgia Professional Standards certification as a P-12 instructional technologist. Students who wish to pursue dual certification in P-12 School Library Media and Instructional Technology can do so by taking additional coursework and completing an extended practicum experience. The department also offers an Education Specialist (Ed.S.) degree that allows students to choose instructional technology as their area of concentration. The Instructional Technology Program offers an Online Teaching and Learning Endorsement designed to prepare K-12 teachers to teach in a virtual educational setting. Courses for all degrees are available online. Stockton University's School of Education offers a Master of Arts in Instructional Technology that combines face-to-face, hybrid and online learning. The M.A. in Instructional Technology is a 33-credit program that includes 15 credits of core courses in subjects such as technology and learning, visual design and communication, instructional design, and instructional technology research. Core requirements also include a capstone experience. Additionally, M.A. students complete 18 credits of electives, including the option to complete an internship or independent study. The M.A. is a cohort program in which groups of students start and end the program together. The Mary Lou Fulton Teacher College at Arizona State University provides an MA in Educational Technology that prepares students for roles as educational technologists in schools and colleges or as corporate instructional designers. The MA in Educational Technology offers two tracks of study: one for teachers and one for instructional designers. Both tracks require the completion of nine credits of specialization courses and at least nine credits of elective coursework in distance learning, emerging technologies or training and performance improvement. Additionally, students are required to complete a supervised applied project. A graduate certificate program in instructional design and performance improvement is also available. Students in the College are eligible for various scholarships, including the $1,000 Althea Rautenburg Smith Endowed Scholarship and the Ernestine Lund Nash Fellowship. Instructional technology specialists (ITS) are on a quest to use technology to improve learning outcomes. In the course of their career, they could be responsible for creating new instructional materials, online courses, technology-based teaching tools and computer-based learning solutions. They evaluate curricula, recommend appropriate IT strategies and implement technical solutions. They work as IT teachers and school technology coordinators, as educational software developers and corporate trainers – practically anywhere where technology is integrated into education. To help you become one of these gurus, we’ve developed this guide to instructional technology program. For each level, you’ll find comprehensive information on your degree options, sample coursework and career opportunities. We also take some of the confusion out of licensure and certification requirements. Note: For more information on becoming a teacher, see our profile of K-12 Education Degrees. Most programs in instructional technology are designed for practicing teachers and are only offered at the graduate level. However, you will occasionally run into bachelor’s programs, especially the Bachelor of Science (BS) in Instructional Design and Technology. Coursework for instructional design typically covers topics such as instructional technology theory, technology systems, digital multimedia, online course creation, eLearning processes and/or electronic communications. Please check the fine print and consider the school’s reputation before you take the plunge. Although these programs may prepare you to work in private education or corporate training environments, they are unlikely to lead to teacher licensure. A master’s degree in instructional technology is a 1-2 year graduate program that grounds students in the theory and practical application of technology in learning. It is designed for school teachers, curriculum developers, corporate trainers and other professionals interested in using technologies to enhance instruction. Because instructional technology is a specialist position, many candidates for these programs already have a bachelor’s degree in education and a state teaching license. However, a number of programs, especially in instructional design, will accept baccalaureate holders without a license. Master of Arts (MA) in Instructional Technology: Typically includes educational theory and liberal arts courses in the curriculum. Students may be required to complete a research thesis for the final project. Master of Science (MS) in Instructional Technology: Typically includes educational theory and science courses in the curriculum. Students may be required to complete a research thesis for the final project. Master of Education (MEd) in Instructional Technology: Typically focused on practical application. The final project may be a portfolio instead of a research thesis. Many programs allows students to select a concentration (e.g. distance learning, multimedia technologies, online course design, etc.). Almost all schools will expect you to complete final year project – either a research thesis or practical portfolio. To gain practical classroom experience, look for degrees that incorporate internships into the curricula. Some pursue a master’s in order to earn a computer/technology endorsement and work as instructional technology specialists in elementary or secondary schools. These experts play a key role in helping teachers, administrators, schools and school districts effectively integrate technology into the classroom. For example, in addition to conducting technology workshops for staff or working on IT projects (e.g. website design), they may be responsible for curriculum planning, needs assessment and IT administration. Outside of the K-12 classroom, graduates find work as media specialists, educational software consultants, curriculum developers, corporate trainers and more. A doctorate in instructional technology is a 4-7 year program that allows students to conduct in-depth research on how technology and media can support learning. A master’s degree is the general prerequisite, although some schools have developed combination master’s/PhD programs. Doctor of Education (EdD) in Instructional Technology: A practitioner’s degree designed to prepare graduates for professional practice (e.g. leadership positions in schools) and applied research. Doctor of Philosophy (PhD) in Instructional Technology: A research-based degree generally intended for students who wish to concentrate on original research and/or become college professors. You’ll also find doctorates in similar majors (e.g. Educational Psychology, Curriculum Development) that offer a concentration in Instructional Technology. After taking high-level courses in research methods and theory, doctoral students spend a good deal of their time in independent research. You may be able to explore exciting areas such as cognitive science, instructional design models, game studies, advances in e-learning and more. EdD students are usually encouraged to apply their findings to design and practice in the classroom. With your doctorate in hand, you’ll be able to pursue educational leadership positions or teaching positions at a university level. Some graduates also work as policy advisers for the government or high-level researchers. A Graduate Certificate in Instructional Technology is a short, non-degree program (~6 months to 1 year) that focuses on ITS fundamentals (e.g. learning techniques, assessment and design). A bachelor’s degree is the general prerequisite, but proof of a state teaching license may also be needed. It’s important to note that a non-licensure graduate certificate is not the same as an add-on certificate/endorsement program. Examine the academic catalog. Good schools will clearly state which certificates lead to endorsement or advanced licensure and which do not. Like the master’s degree, many certificate programs incorporate professional internships into the curricula. A graduate certificate is cheaper and faster than a master’s program and may enhance your job opportunities. A job candidate with solid skills in technology integration will have the advantage when it comes to applying for certain positions. Add-on certificates and endorsement programs are designed for certified teachers who wish to teach in a new field, subject area or grade level and have this skill endorsed on their existing teaching license. IT teachers, school technology coordinators and district educational technology leaders typically pursue the instructional technology specialist (ITS) or computer/technology endorsement. These programs may require candidates to develop an online portfolio and complete significant fieldwork (i.e. internships). Add-on certificates are not the same as non-licensure graduate certificates. Schools will make it very clear if their programs are intended for endorsement. Candidates with a graduate degree may only have to complete ~20-26 credit hours (i.e. an endorsement-only program); candidates without one can work toward a master’s degree and state endorsement at the same time. Whatever your career goals, we recommend you attend a college or university with regional accreditation. This is a “seal of approval” granted to non-profit and public institutions by one of six regional accrediting bodies (e.g. New England Association of Schools and Colleges). You can learn more about the difference between national accreditation, regional accreditation and diploma mills in Accreditation: Understanding the Difference Between Real Schools and Diploma Mills. Regional accreditation is only granted to the school – it doesn’t focus on individual subjects or degrees. If you’re interested in the quality of the education program, you can also see whether it has CAEP/NCATE/TEAC accreditation. In 2013, the National Council for Accreditation of Teacher Education (NCATE) and Teacher Education Accreditation Council (TEAC) merged into one organization for accrediting teacher education programs. It is called the Council for the Accreditation of Educator Preparation (CAEP). Eventually all programs currently accredited by NCATE and TEAC will be accredited by CAEP when they come up for accreditation renewal. In the meantime, you can look for NCATE or TEAC on the university’s website. No. However, NCATE or TEAC accreditation does show that an education program meets a series of quality standards. If you’re thinking about an unaccredited program, make sure it has high graduate placement numbers and a solid reputation within the teaching field. Some public schools require instructional technology specialists to hold a teaching license. Others will only want to see proof of a graduate degree in education, curriculum development or instructional technology. Please check with your State Department of Education for precise details. If you’re interested in licensure, we have a summary of how to earn your initial license in our article on K-12 Education. Once you have your initial teaching license, you may wish to complete a computer/technology or ITS endorsement. This is an additional descriptor that the state adds to the license once you have fulfilled requirements. You may able to earn an endorsement during the course of your degree or afterwards by completing an add-on endorsement program. Certified Education Technology Leader (CETL): Offered by the Consortium for School Networking (CoSN). Leading Edge Certifications: Platform- and vendor-neutral programs offered through an alliance of non-profits, universities and educational agencies. Voluntary certifications won’t help you become a certified/licensed teacher. It’s confusing because the terms “teacher certification” and “teacher licensure” are used interchangeably by many people. Your state department of education or agency is the only body that can approve you as a certified teacher and grant you an official license to teach.